Communication access: Captioning, sign language interpreting and hearing loops will be available at the presentations. The event is free and afternoon tea will be provided. 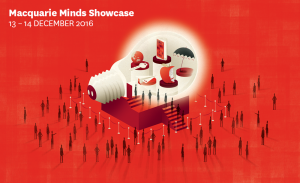 To register: please go to Macquarie Minds Showcase event page. Bringing together a compelling group of visionaries, researchers and experts across diverse fields, this two-day event showcases the power of research that transcends traditional academic boundaries to shape a more positive future. By providing our world-leading academics with a platform to showcase their research and teaching expertise, Macquarie Minds will highlight the University’s key strategic priorities and commitment to providing a culture of transformative learning in a research-enriched environment.